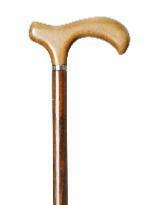 A practical walking stick for everyday use, this Melbourne beech wood derby is distinguished by the colour contrast between its light brown handle and dark brown shaft. Fitted with a smart collar and a non-slip rubber ferrule, it is ideal for many occasions, whether in town or country. Its overall height is 92cm (36"). Ferrule diameter 19mm.